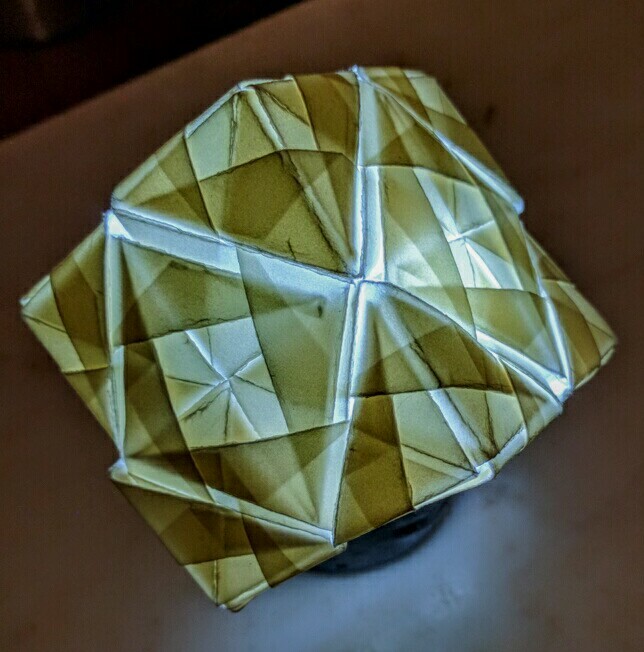 I came across a video tutorial for this lantern, made it, then posted it on my Twitter account, @PaulaKrieg. Folks there showed such interest in it that I thought it would be good to post here as well. Also, I am writing this post as an experiment, as I am attempting to write this using just my phone. 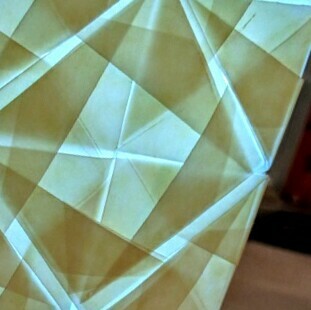 Here’s one of the tricky parts of doing post by mobile: trying to add this link to the SonobeCubeLamp tutorial. When I get back to my home computer in a couple of days I will fix that link if it doesn’t work. 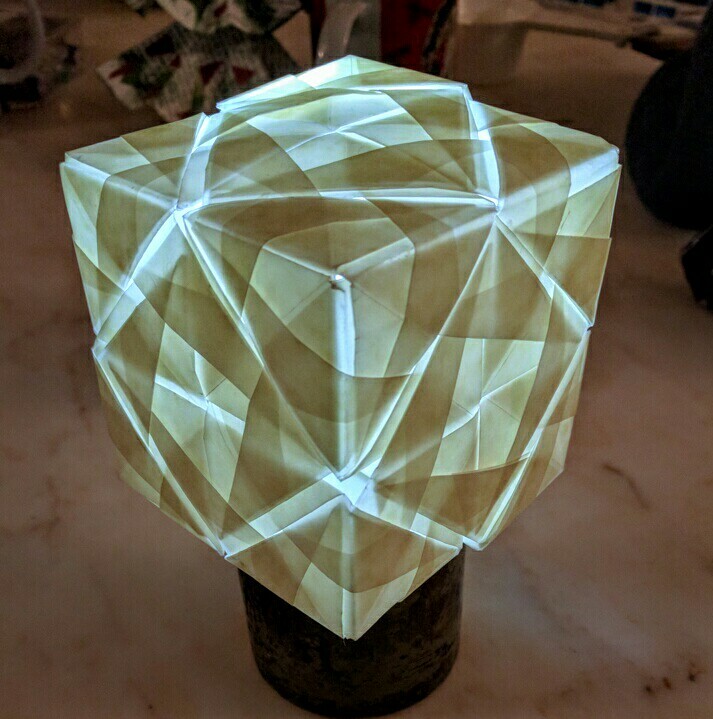 If you try making this lamp, here’s a tip for assembling the modular origami units:think of the pieces joining together by creating tension, in other words, notice how when one corner slips under a joining unit then the other corner goes over an opposing joining unit. 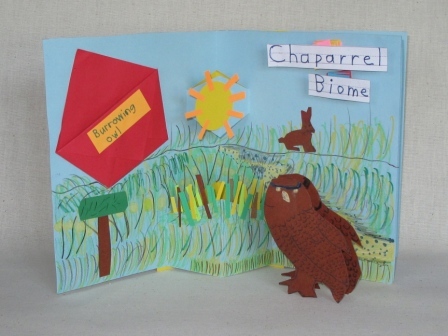 This will be the last of the posts that I am going to write about these magnificent biome books made by Mrs. DePace’s second graders. 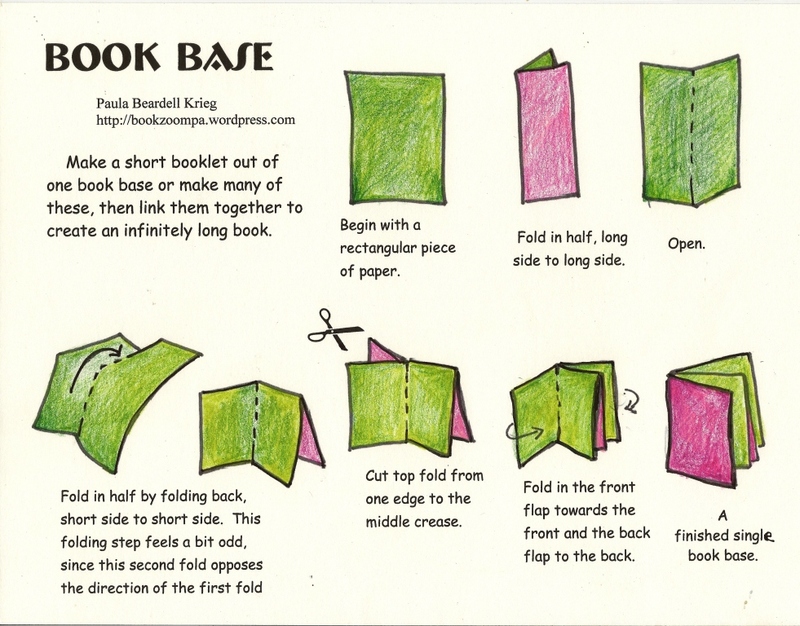 The books were made from one sheet of folded paper, about 17″ by 35″, folded as a single Book Base. 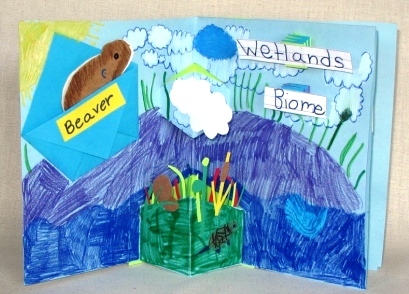 This gave students a front cover, back cover, a two page spread to illustrate the biome, and a two page spread for writing. The first spread of pages is full of interesting features. 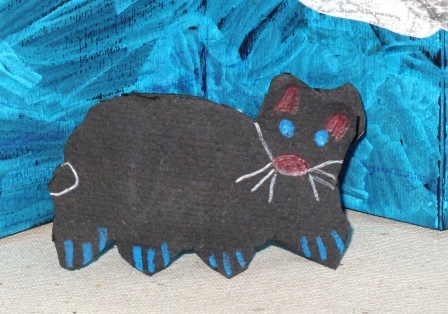 Students drew an animal, which was stored in an origami pocket. Actually, students made two of these animals, and attached them together with a paper spring, so that they could be freestanding. In the middle of the spread are a couple of simple pop-ups. 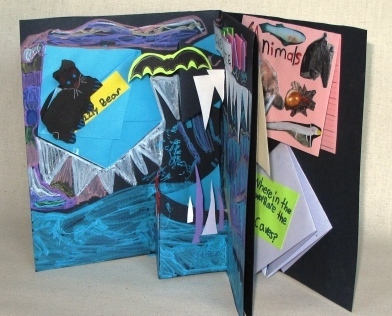 Students glued items on to these simple pop-ups for a wild effect. This first set of pages is labeled by a title that is attached to the page by more paper springs. 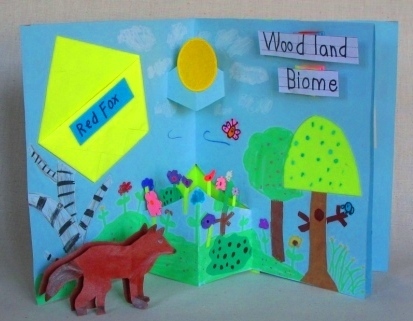 Title of Biome, attached with paper springs. 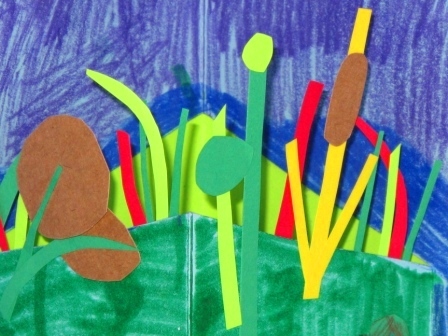 The rational behind using paper springs here is that students love making paper springs, so any excuse to make them is a good one. The second spread of pages is where all the research goes. 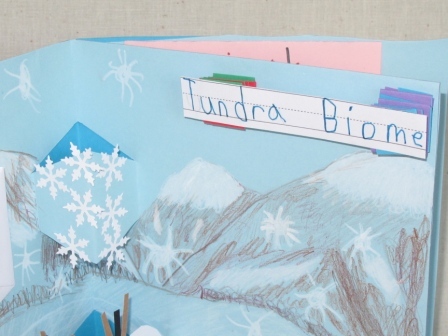 The writing for these Biome Books happens, for the most part, on the second spread of pages, in mini books which were worked on individually, then glued, with glue sticks, into the book base. Mrs. DePace guided student reaserch, then the students added their writing to these mini-books. I that the students were required to look for images to collage on to the cover of some of these papers and that the titles of these little books are boldly printed. When I spoke to the students I compared each of the booklets to paragraphs, saying that they could write a typical report on paper, using paragraphs to separate subject matter. 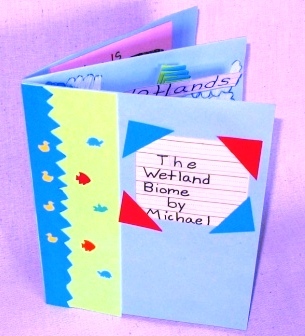 They liked the idea of, instead, using these little booklets to separate the subject matter. Just for the sake a variety, the little booklets, which were simply folded cover stock papers with lines, opened in different directions. 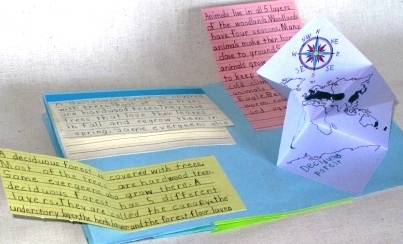 The one on the lower right has a map of the world on it, along with a compass rose at the top, on which the students colored in the places that their biomes exist in the world. This is end of the Biome Posts. I hope you have enjoyed these images as much as I have. Good work! bi·ome NOUN: A major regional or global biotic community, such as a grassland or desert, characterized chiefly by the dominant forms of plant life and the prevailing climate. This past spring, for about the 12th year in a row, I had the great pleasure of making books with the elementary students of Mrs. De Pace. Generally when I work in schools I try to leave the teachers with a minimal amount of work to do alone with the students. I try to help structure every piece of the project. Not so with Mrs. DePace’s classes. I pile work on her (as per her wishes). 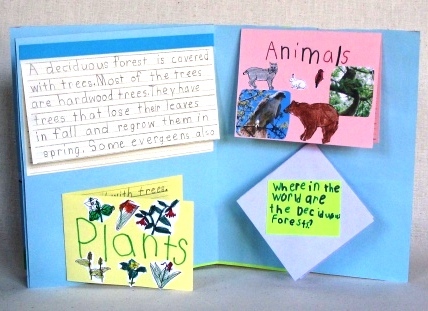 Each year Mrs. DePaces’s students second-grade students rise to her standards and create extraordinary books. 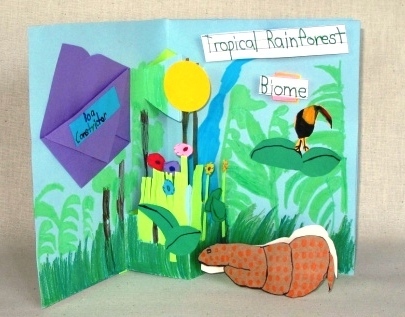 This past spring Mrs. DePace requested that I work with her class on making Biome Books. Each student in her class picked a Biome to research. 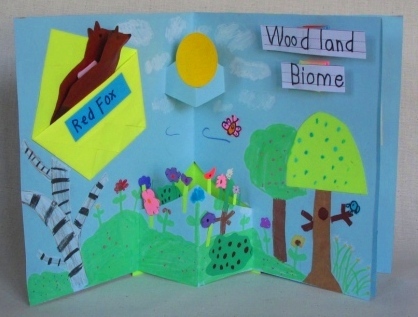 The design elements of these books had to include room for a visual representation of the biome, as well as plenty of writing space about the animals and plant life, climate and characteristics and location of the biome. 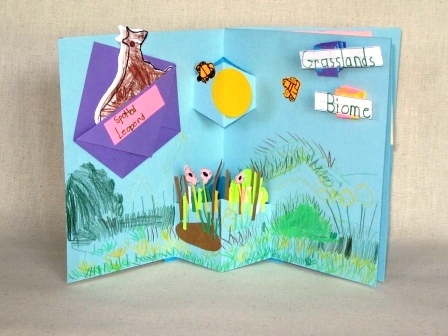 The first spread of pages is the a dramatic illustration of a specific biome. This page is done with cut paper designs and gel marker. 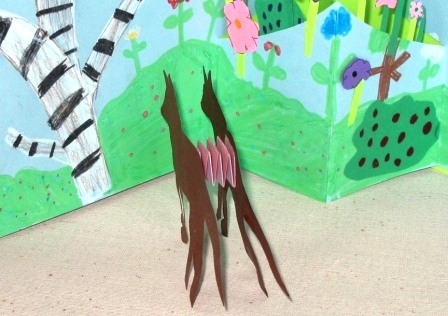 There are two pop-ups on the page, an indigenous animal in an origami pocket, and a label popping off of the pages thanks to the paper springs that the label is attached to. 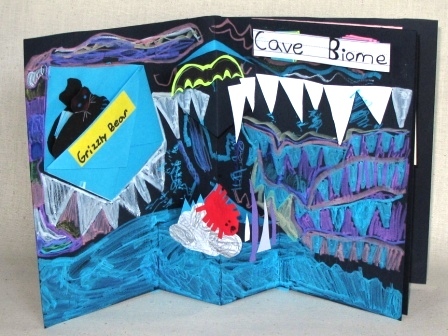 My next few posts will contain more photos of these student made biome books, along with the details of their construction. Now, however, its time for to pick up my daughter from school, so this is all for today….